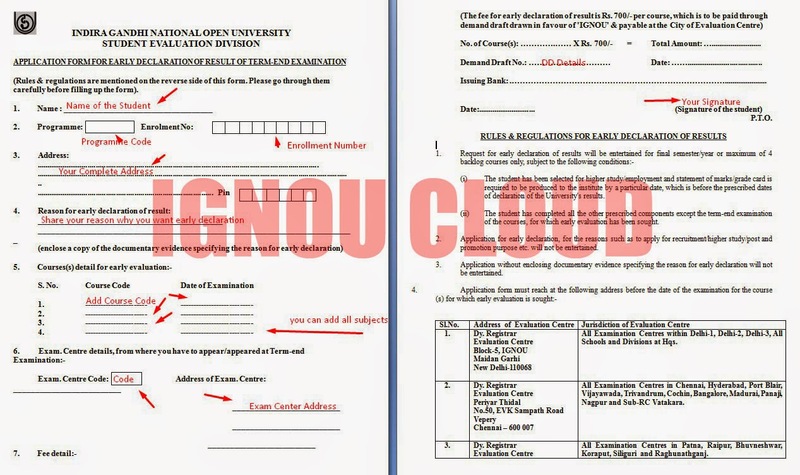 Most of the Students Got Jobs and wants to go for higher studies just after the final exams of their IGNOU Programmes, But IGNOU Generally Announce results in August of February which is very late and some students wants their results as early as possible, For those kinds of students IGNOU Provide a Special facility by which A Student can get his/her early Declaration of results. The fee for early declaration of result is Rs. 700/- per course, which is to be paid through demand draft drawn in favour of 'IGNOU' & payable at the City of Evaluation Centre. (i) The student has been selected for higher study/employment and statement of marks/grade card is required to be produced to the institute by a particular date, which is before the prescribed dates of declaration of the University's results. (ii) The student has completed all the other prescribed components except the term-end examination of the courses, for which early evaluation has been sought. 2. Application for early declaration, for the reasons such as to apply for recruitment/higher study/post and promotion purpose etc. will not be entertained. 3. Application without enclosing documentary evidence specifying the reason for early declaration will not be entertained.